dispel the myths and get the facts. Accurate services that complies with the Fair Credit Reporting Act and EEOC guidelines through the direction and supervision of our legal staff. We can offer many seminars training your management staff regarding how to handle themselves in any one of these potential situations. 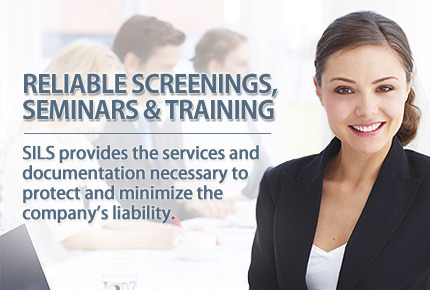 Background Checks, Pre-Employment Screening, Human Resources Consulting, Safety Training and more. Our smarter, comprehensive research techniques produce thorough, accurate background checks that complies with the Fair Credit Reporting Act and EEOC guidelines through the direction and supervision of our legal staff. Should you run background checks? Background checks are a crucial part of the hiring process. You should check the background of applicants for any position as thoroughly as possible. This check should include criminal records, so that you can protect yourself as well as your customers. The next page list some of the benefits of performing criminal background checks. 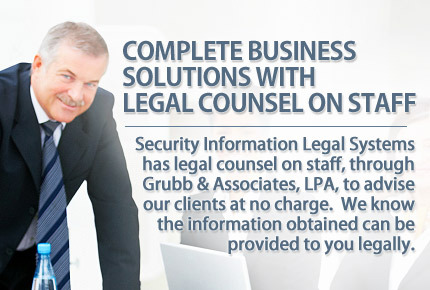 Security Information Legal Systems has legal counsel on staff to advise our clients at no charge. 3)	Insulate your business from liability that might arise if you fail to perform background checks. 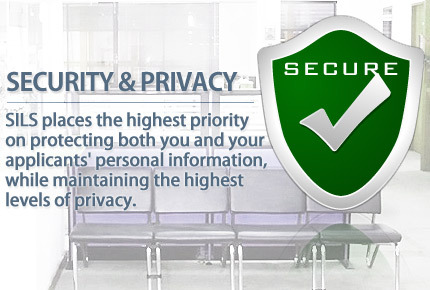 We know the information obtained can be provided to you legally. Contact us with any questions. 1)	If your employees have contact with the public and occupy positions of public trust. 2)	If your employee engages in an occupation that could place members of the public at risk. Example: An employee driving a company vehicle or their vehicle on company business. 3)	Consider the circumstances the employee will be placed in performing job duties. Example: Access to cash, checks, merchandise, inventory, etc. Be careful how you check into an applicant’s criminal background. You cannot make a hiring decision based on an arrest record, only conviction records should be obtained. For credit reports you must comply with the Fair Credit Reporting Act. You should consult with legal counsel before conducting any background screen. There are no contracts to sign, you can choose the information that will be most beneficial to you in your hiring decision. Selecting the right background screening company can be as complex as selecting the right candidate. Out-Sourcing this task to Security Information Legal Systems (SILS) can add dollars to your bottom line by helping you select the right candidate and our prices are reasonable. See the advantages SILS has over it's competitors. We can offer many seminars training your management staff regarding how to handle themselves in any one of these potential situations. They will learn what documentation is needed to protect and minimize the company’s liability and also themselves. Out-sourcing your more routine matters allows you to get more from your current HR department without incurring the expense of additional HR staff. Security Information Legal Systems, Inc. (SILS) has been providing Pre-Employment Screenings to clients since 1993. However, we are not just a pre-employment screening company but a company capable of a diversified service in Human Resources Consulting and Employment Law. Our firm has a legal staff who concentrates on Employment Law, and will protect your interests at an Unemployment Hearing or a Workers’ Compensation Hearing. We can assist you in avoiding, or minimizing those expensive lawsuits on harassment or termination decisions. We can offer the latest changes and updates on the employment laws from our legal counsel. Let our staff apply their expertise and creativity to your business system needs. We are always happy to provide you with a free quote on any of our services. President of Security Information Legal Systems, Inc.
Security Information Legal Systems Inc.
A BBB Accredited business since 02/17/2006.